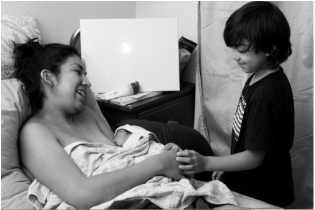 As a doula, I work with laboring women and their families, offering non-judgmental support. I work in all settings - hospitals, birth centers and in the home. I offer a complimentary initial meeting to discuss your birth and what you need from a doula. If, after our initial meeting, you decide to have me as your doula, we will continue to meet for prenatal visits (one or two). At our meetings we can discuss your birth preferences, signs and stages of labor, practice breathing and relaxation techniques, laboring positions, as well as answer any questions or concerns you have about your pregnancy, birth or the postpartum period. As your doula, I offer 24-hour phone and email support for you throughout your pregnancy and I am on-call for you from the time you hire me until you have your baby. I will also give you access to my ever-expanding lending library. I will provide physical and emotional support throughout your labor and birth. I will provide initial help with breastfeeding and any continued support during your first hours postpartum. In your first week postpartum, I will make a home-visit to ensure that breastfeeding is going well and your transition to parenthood or expanding your family is going smoothly. I can also help with infant soothing techniques, newborn care, babywearing, diapering solutions if desired, and referrals to available community resources. Contact me to set up a free meeting. Additional discount if registering for Childbirth Class.